Kitchen Nightmares Exec. Producer Arthur Smith Talks Return To Amy's Baking Company - Are You Screening? Well, as you know by now, Kitchen Nightmares is finally airing the return to Amy’s Baking Company episode tomorrow night as part of a two-hour return of the show. I’ve already gone over the episode in as much detail as I dare give away, but Arthur Smith, the executive producer on the show, has a bit to say about the episode. There aren’t many episodes of television that have ever had this kind of response, and we might as well hear from everyone possible, and the conversation gives you some hints of what to expect. He also goes over other points of the upcoming season, and, I think, gives an interesting perspective on the behind-the-scenes world. I’ve said this before, and I think it is worth repeating, for all the drama and general wackiness of reality television, which I am largely prone to make fun of, I really appreciate the existence of this show (and others that are in the “expert comes in to help” genre). People may have a range of ideas about Gordon Ramsay, and I think for Americans that is because we don’t have the benefit of the broader television history, like The F Word, for example, but if you pay attention to Kitchen Nightmares, he’s really out to help people. The cynics will obviously say that it’s just about making money like any other series, especially those that have the skewed perspective of only being familiar with Hell’s Kitchen, but there are a lot of decent people who are only still in business because of this show. If we’re going to have to have a lot of reality television, I’ll take doing something worthwhile along the way. At any rate, get ready for tomorrow night (and let me know what special viewing party you have planned), and catch a bit more of the story. So, I had a chance to see the episode. It is very engaging, very explosive, in some ways. Can you take us back to when Ms. Garcia shows up at the restaurant and they look a little bit surprised, but are they really surprised? Did they know she was coming? Were they aware that they were going to be thrust into this episode again? A. Smith – No, they weren’t aware. I mean, we had – there was communication, as we have with all the restaurants. We talk to them and check up on them and everything else like that, so there had been conversations with them about what was going on, but you know, she really did just show up, but naturally we had to be allowed in, which they did. So it – the way you saw it was the way it was. There was no, like, “We’re coming at such-and-such a time” type of thing. They seemed as if at one point Samy was asking for money. He wanted to be paid for it. We never saw the resolve of that. I guess he didn’t get paid, but they did seem pretty upset when she showed up, and why did she show up? Why not Gordon? A. Smith – Well, I mean, you know, listen, the reason for – I’m just going to back up for a second. The reason for us doing this special, you know, as you know, in seasons past we’ve done revisit specials and we’ve gone back to places and there’s actually going to be a revisit special in this season. This show caused so much attention for a variety of reasons and we decided to, you know, devote more time than just putting it in a revisit show of which we do usually three or four restaurants. So you know, considering it was the only episode in the almost 100 episodes that we’ve done that Gordon walked out of, you know, like I said, that was another reason why we did it. The way things were left, with Gordon walking out and it being a very heated departure, we decided that it was best that, Gordon didn’t go nor did he want to go back because, you know, it didn’t end well. You know, most of our Kitchen Nightmares episodes end – as you know, they end very happy. We’re there to help and that’s what Gordon was trying to do the entire time he was there. So, we preferred to do it this way. You know, send a reporter in, and have her check up on them and see what they’re doing and see how they were feeling and everything else, and as you know, in the show, for those of you who haven’t seen it yet, I mean, Gordon’s hosting the show. He is providing commentary on what he went through, what he was feeling at the time. He’s also introducing pieces about the media firestorm that happened following the airing. He’s also introducing and setting up bonus material that didn’t fit into the show. It was a tough show to edit down to 42 minutes, so we had a lot of extra material that we thought would be interesting for people to see. I don’t watch a lot of reality shows but one of the things I always wonder when I watch them, and I did in this case, too, is you know, just how much of it is “real,” so I was wondering about Amy and Samy. Are they just looking for attention so they sort of play up a lot for the camera or are they just kind of really dysfunctional, to put it nicely? What do you think it is? A. Smith – I can’t answer for them. That’s something I can’t answer for them. Kitchen Nightmares is real. I mean, it’s a documentary. This notion of reality shows that are scripted, you know, it’s not Kitchen Nightmares. Kitchen Nightmares documents what happens each week when Gordon Ramsay shows up at a restaurant and tries to turn it around. You know, the thing about most of these restaurants for a lot of people – and I’ll get back to Samy and Amy in a second – but for a lot of people, opening a restaurant is the fulfillment of a dream and they’ve had an idea in their mind probably years before about what they wanted to do, and it’s always hard to listen to somebody come in and say, “You’re not doing right.” You know, it’s interesting because they ask for Gordon’s help, but as soon as they hear some of his critiques it’s like they don’t want to hear it because people want to confirm what they were doing was right. Unfortunately, if it was right, then the business would be doing better. As for Samy and Amy, like I said, it’s the same thing I would, you know, not just say for Samy and Amy; I would say for any of the people who’ve appeared in our show. You’re always better off talking to them than for me trying to figure out their actions. Gordon, he has quite a reputation from the shows of being kind of abrasive and foul-mouthed. Is he more like that in real life or nicer or what would you say? A. Smith – You know, Gordon Ramsay is a complete gentleman. I’ve known him for a long time now and you know, we also do Hell’s Kitchen with him. You know, he is on a mission. Actually, the thing about if you watch Kitchen Nightmares and you watch the breadth of the shows that we’ve done over the last six years, I think he is always on point, he’s always fair, he’s always open and you know, kitchens are – there’s a lot of, there are tense situations and things do escalate, but you know, especially on Kitchen Nightmares. You know, there’s a lot of nurturing moments on Kitchen Nightmares. I mean, there’s a lot of things that, you know, he does. 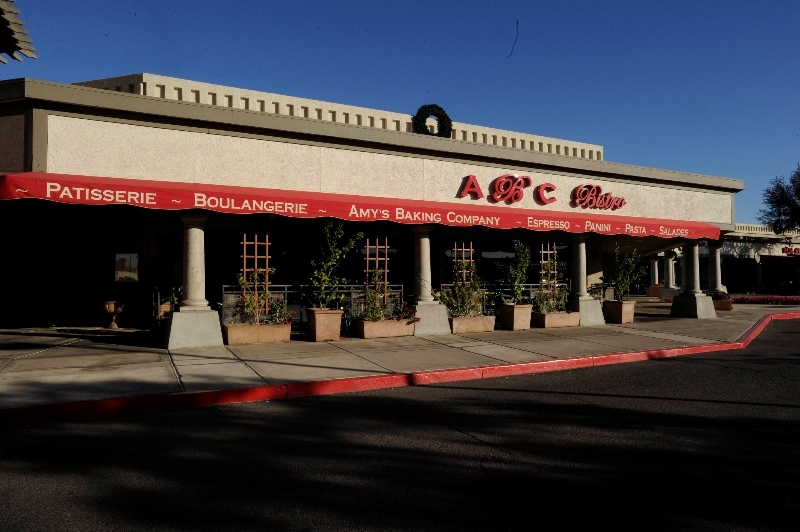 It’s interesting – the episode that follows Amy’s Baking Company this Friday, there’s, you know, “The Return to Amy’s Baking Company” is at 8:00 and then there’s an episode at a restaurant called Pantaleone’s in Colorado. Gordon and the owner of the restaurant, who’s probably the most, maybe the most stubborn owner Gordon has ever met with, they really built a phenomenal relationship and I don’t want to give away what happens, but they have such a great connection, and you could see how Gordon really cares about him, as he does about all these places. He really does take this very, very, very seriously. He really is there to help, and quite frankly, even as far as Amy’s Baking Company, it was very disappointing that he didn’t get to finish his plan. He showed up on the next day to complete a plan. He just never got to do it, and he did have a plan. So you know, the policy is always for Gordon as well as everybody who works on Kitchen Nightmares is to make, you know, to do the best we can at making these restaurants better than when we first arrived, and that’s our goal. You know, we’re going to businesses that are in trouble, so it’s always difficult to turn them around, but our goal is, you know, we just have to try to make them better. Hopefully that will work? Sorry, a very long answer to your question. I have a question in reference to Bella Luna, which I believe is the series finale. They’ve since had liquor code violations and have closed. I’m just wondering – clearly, they’ve had their share of problems, but I was curious what the most glaring problem was when you were there. A. Smith – Well, I think… I’ll back it up. They had lost their way. It’s a mother and, a couple of sons and I think they… they had a vision of what they wanted it to be and I think that without telling you about what’s in the episode, it’s that, their standards weren’t quite what they needed to be to serve Easton. I think that they made some bad assumptions and the problem with most of these restaurants is the food, right? So they had a lot of frozen food and Rosaria, who’s a wonderful person, and this great Italian family, but you know, it wasn’t as authentic as it needed to be and it wasn’t as fresh as it needed to be. So like I said, I don’t want to get into too much detail and of course, I can’t comment on any issues that they’re having, outside of what happened when we were there, but they were lovely people and the sons were awesome. You know, one of the things about Gianfranco, who was – you’re really testing my memory here – one of the things about Gianfranco, the son who was working in the restaurant, was, you know, he became a head chef. Basically, his mother installed him as the head chef with very, very little experience, so Gordon gave him like a phenomenal crash course – a phenomenal crash course. I mean, the other interesting thing about Kitchen Nightmares is what people don’t see because it’s not that interesting for television, is the amount of training that happens behind the scenes or that’s not covered on camera. There’s actually training going on. The restaurant does open. The public really does come, so there’s a great deal of training that goes on. We actually leave them with a manual and a guidebook and there’s a lot of care that goes into not only changing it but training them and then trying to give them the roadmap to follow. You know, like I said, we take this very, very seriously. As a follow-up to that question, what’s the track record for the show of the number of restaurants that have succeeded versus those that have closed after you’ve been there? A. Smith – Yes, you know, I don’t keep the stats. I really don’t. The restaurant business is a tough business as it is. Most restaurants close within their first year of operating. There’s some horrific stats in that regard and you know, I’m not quite sure. Like I said, we go to restaurants that are already in trouble. The fact that we’re able to save a number of them I think is quite an achievement and you know, they also have to follow the plan, too. So you know, some of them want to go back to their old ways, so there’s a lot of variables that we can’t control. We know that when we leave them we’ve left them better and hopefully, hopefully they follow the path and they’ll have great success. That’s why it’s important that we do – that we always like to do a revisit special each year. We, along with FOX, talk about, you know, as we’re planning the show, it’s like people are very curious about what’s happened. It’s exactly what you’re saying. So that’s why we always have a revisit special and this year we are doing a revisit and we’re going back to at least three restaurants so you’ll get an indication on how they’re doing. I’m curious, what was one of the biggest surprises of the season or largest transformations? Is there anything that you were really blown away with? A. Smith – This coming season? A. Smith – Okay, this coming season we have a lot of – as I said, there were some strange things that happened. There was a restaurant in New York in Queens, and it was called Kati Allo. We probably had the biggest reaction I’ve ever seen to a makeover. As you know, we always makeover the restaurants or makeover the restaurants that need it, which is most of the time. The owner, Christine, I have never seen a reaction to a makeover like that. I thought she was going to pass out. I mean, it was like so huge and we always get good reactions because we do – there are some dramatic changes. It was wild. We also – , there was a restaurant this year called Old Neighborhood which was in Colorado, near Denver. You know, we’ve had bad kitchens before, but this dining room was a disaster. I don’t think we’ve ever had that combo of dining room and kitchen in bad shape, but we had both. Gordon goes on this mission and some of the stuff that he finds is going to be – is quite shocking. So that was, you know, memorable. The interesting thing about this year is that we really focused on family businesses this year. Every restaurant in this season I think for the first time is a family-operated business. So we have husband and wife, we have mother and son, we have father, mother and son, we have father and daughter, we have mother and daughter, we have aunts and niece, which is an interesting combination. So you know, so yes, that’s another unique quality. It’s our first time in Colorado. We’ve never been to that part of the country. We always try to go to new places every year. It’s probably the most emotional season we’ve ever done when I think back on it. I can’t – I mean, every one of them, as I’m like thinking back, every one of them, you know, just so emotional. It’s yes, I mean, great stories. Really, really great stories. I’m wondering if you can kind of talk about why you think it (the original Amy’s Baking Company episode) resonated so much with viewers and why it became such a, you know, such a crazy hit online. A. Smith – Alright. So if you can recall, it was extremely intense and I think people – you know, Gordon walked out, and Gordon never walks out. So the intensity of it, the drama of it, I think was compelling and I think people were very, very curious about what was the restaurant that Gordon just had to walk out on and why he walked out. I think people were – you hear about Gordon Ramsay, the man who’s, you know, done almost 100 Kitchen Nightmares and has never walked out and what could have happened that made him walk out? Believe me, as you know, as you may know if you’ve watched a number of episodes, there are harder ones and more challenging ones and times when Gordon almost walked out, or ones where he even regretted going, but never before has there been one where he felt that he needed to because he felt he couldn’t help them because they weren’t interested in what he was saying no matter how he said it or when he said it or what he said. So I think that yes, I think that’s why it was so, people were so curious because yes, you’re right, millions watched it on the Internet.